With the Fourth of July long weekend almost here, many of us have started thinking about celebrating; spending time with family and friends, whether it’s at the cottage, the trailer, or in your own backyard. Of course, these kinds of celebrations always involve food and drink, and plenty of it. And there’s nothing wrong with having a few drinks on a special occasion, right? Especially since so many studies these days are saying some alcohol is even good for you. However, you may want to think again. When it comes to alcohol, there is always some serious confusion. There are studies that show it can be beneficial to your health, while there are others that clearly show it’s bad for you. It’s usually the studies touting how healthy it is that get the most play in the media, but let me assure you: for the most part, alcohol is detrimental to your health. For example, alcohol’s known to help blood flow when consumed in limited amounts, by relaxing blood vessels and thinning blood. On the other hand, alcohol is a known contributor to cancer, cirrhosis, and a host of other health problems that are physical, emotional, and personal in nature. Not to put too big of a damper on the party, but what’s often overlooked is the death risk posed by excessive drinking. Excessive drinking, or binge drinking, consists of consuming more than three alcoholic beverages at one sitting. Sound familiar? It’s something one in six working-age Americans do. When people think of binge drinking, they think of hangovers, and when they think of the problems associated with alcohol, they usually think of those experienced by longtime alcoholics. But excessive drinking is killing one in 10 working-age American adults. 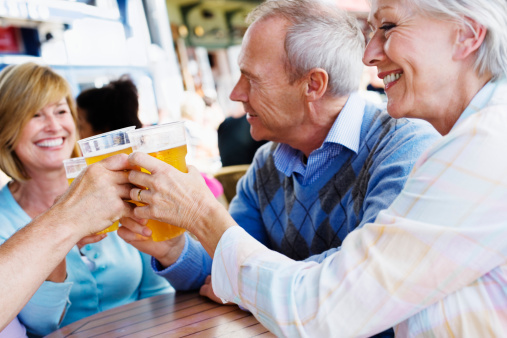 Not only is alcohol killing 10% of Americans under 65, but one in six in this demographic drink excessively. In fact, alcohol is the fourth leading cause of preventable death, behind smoking, diet, and inactivity. It can be very difficult to escape situations where alcohol is the focal point. Holiday celebrations are a tough one. Summer, too; on a hot day, people tend to reach for a cold drink, and if you’re an adult, that drink typically contains alcohol. It’s also easy to have more than one when you’re sitting around with friends, loosening up and enjoying yourselves. Drinks after work are the norm, too. If you like to drink, make sure you’re responsible about it. Try to limit your intake to one or two drinks when you do consume alcohol and try to control the situations around you. Drinking sparkling water, changing your lifestyle, and trying virgin cocktails are all ways to enjoy your life while scaling back alcohol use. Stahre, M., et al., “Contribution of Excessive Alcohol Consumption to Deaths and Years of Potential Life Lost in the United States,” Centers for Disease Control and Prevention web site,” June 26, 2014; http://www.cdc.gov/pcd/issues/2014/13_0293.htm. Shute, N., “Excessive Drinking Causes 10 Percent Of Deaths In Working-Age Adults,” NPR web site, June 26, 2014; http://www.npr.org/blogs/health/2014/06/26/325489951/excessive-drinking-causes-10-percent-of-deaths-in-working-adults?sc=ipad&f=1128.